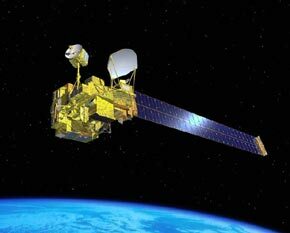 The second Advanced Earth Observing Satellite (ADEOS-II) was as a NASDA/NASA/JPL partner mission launched on 14 December 2002. By 10 April 2003 the SeaWinds scattorometer on ADEOS-II began to provide science quality measurements to derive ocean surface wind velocity observations. ADEOS-II suffered a premature power failure on 24 October 2003, which resulted in the termination of the ADEOS-II mission. SeaWinds on ADEOS-II provided the same 90% daily global ice-free ocean coverage as QuikSCAT, allowing for a tandem collection of high quality wind vector observations for more than 6 months.